Thematic maps used for briefing a wide range of users from responders to high government officials were produced at the Jackson EOC. GISCorps members Beni Patel from Tessellations Inc. in Texas, Sanjeev Arya from GeoDecisions in Illinois, and Kim Holden from South Central Connecticut Regional Water Authority worked on road closure, cell phone coverage, environmental hazards, and aid and comfort maps. Mark Hollingshead, GISCorps member who is an Esri instructor at the Esri-St. Louis office, worked with a staff member from the state Department of Energy to produce a series of maps showing the restoration of power throughout Mississippi in the days following the hurricane. The Brain Bus group mapped the locations of open kitchens and shelters operated by the Red Cross and other relief organizations. Creating these maps underscored the need for relief organizations to submit location information in a standard format ahead of time. Too much time was wasted looking up and cleaning addresses for these facilities. Indexed search maps for responders and strike teams were among the most useful products produced by the map team. Initially, 200 maps were printed within 10 hours. This map set was revised and expanded to cover an eight-county area for use in house-to-house searches. Sean Bohac, GISCorps volunteer and GIS specialist from San Diego, California, observed, "It's not easy to understand how important something as simple as a street map can be to folks who need one, until you find yourself in the middle of a disaster." After several days, the map production team had standard map products that were updated and printed on a daily basis. These products were tremendously useful to responders and managers and for keeping the public informed. With many volunteers working on the same data, migrating the personal geodatabase created early on to an ArcSDE database became imperative. An ArcSDE database would allow for multiuser access and editing and support an internal ArcIMS site for disseminating current data to Brain Bus workers and Mississippi Emergency Management Agency (MEMA), FEMA, and National Guard personnel. Keith Kite of the Esri-San Antonio office and GISCorps volunteer J. D. Overton of the Esri-St. Louis office worked on implementing ArcSDE with Citrix. Instability of network connections, both with the Internet and within the Brain Bus, caused problems with the Citrix/ArcSDE connections. While these problems were being resolved, an intrabus "sneaker net" supplied updated shapefiles via thumb drives. With this approach, adhering to file naming conventions was critical. In addition to map products, volunteers at Jackson EOC worked on a Web-based database for documenting missing persons and calls for service during the first week after the hurricane. The database, designed by volunteers from Esri business partner Digital Quest, accepted input externally from the Mississippi Emergency Management Agency Hurricane Katrina Missing Persons Report Form Web site and internally from MEMA-authorized personnel who entered paper-based missing persons reports. Information on nearly 10,000 missing persons was documented. This data was also used to create maps for the U.S. Coast Guard. By the time GISCorps received the request for a second deployment of volunteers, Elhami had a waiting list. On September 10, again just 48 hours after being contacted, a second deployment of nine GISCorps volunteersall map production specialistsbegan arriving in Mississippi. Two members began working in the Brain Bus while the balance of the group was dispatched to locations in Stone, Pearl River, Jackson, and Hancock counties. Other deployments would follow. Brooks was effusive in his praise of the people who responded. "I cannot thank them [volunteers] and GISCorps enough. Working with Shoreh to find volunteers relieved me of a tremendous and difficult burdenthere was no way I could have found such qualified, professional, and cool-and-steady persons on such short notice, going it alone," he said. Elhami has received many positive e-mails from volunteers that indicate the experience also meant a great deal to them. "Saving lives by volunteering using skills that few people have gives volunteering a whole new meaning. I never thought GIS could mean so much until after this mission!" said GISCorps volunteer Matt Cieri from the city of Kissimmee, Florida. The deployment gave volunteers a greater sense of the importance of their day-to-day work. "The support that maps bring to an EOC is unimaginable." said GISCorps volunteer Paul McKnight. "The sense of providing a valuable skill set and product to the situation is immediate, and the people we were supporting were genuinely thankful for our presence." McKnight, who is a GIS manager for the city of Austin, Texas, also worked on a GISCorps project in Indonesia in spring 2005. Out of the controlled chaos of the Jackson EOC and the other emergency response locations in Mississippi where volunteers worked came information that helped the response to one of the most extensive disasters in United States history. Some GISCorps members shared insights gained from this and other GISCorps projects. Given the limited time available to become familiar with the data, many members mentioned the importance of good metadata in addition to the need for cleaner and more complete datasets. Under the heading of "some things don't change," Hollingshead observed, "Good GIS practice still needs to be followed; it's just that you can't be as analytical because the time frame is compressed." He urged developing multipurpose layer files and templates that save time, make maps more consistent, and avoid wasted effort. Hollingshead also suggested having clearly defined roles. In particular, assigning someone to track down useful data can make a big difference in the effectiveness of the entire effort. In this case, Tele Atlas/TomTom and other, better datasets could have been used sooner if volunteers had known about their availability. Addressing another data issue related to the production of maps showing shelters and kitchens, Heather Milton, a GISCorps volunteer from the Esri-St. Louis office, said, "Having a GIS person and a database specialist in any EMA [emergency management agency] to help define data issues ahead of time and get all the participating agencies to share standardized data would be a huge step forward." Milton, who volunteered for the GISCorps project in Indonesia earlier this year, is an ArcGIS instructor and served as a technical support person for other team members. She also edited data; created layouts and map books; and helped organize the file structure, centralizing the location for layer files, templates, map documents, and PDFs. For more information about the GISCorps program and its volunteers, see the accompanying article, "Closing the Digital Divide." 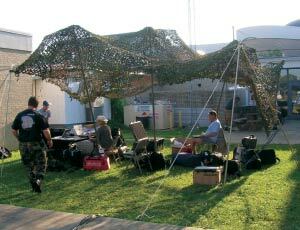 In Jackson and throughout the area affected by Hurricane Katrina, contributions to response efforts, too numerous to list in this brief article, were made by geospatial specialists from many organizations and government agencies. The author thanks Shoreh Elhami, Talbot Brooks, Heather Milton, Paul McKnight, and Mark Hollingshead for their help in preparing this article.